Coral Castle seems to be a never ending mystery. You may not have seen the castle itself, but if you have airline tickets to a nearby area, it is definitely worth taking a look. It is not often you get the chance to see an ancient Megalith construction. In the mean time why not read the following on the topic? Coral Castle is an unsolved megalith whose secrets of construction can be uncovered and proved using only information found on the Internet. This article presents the proof and links the technology used to construct it to a scientist's theory for Egyptian pyramid construction that was rejected several decades ago. CHRIST JESUS – HIS help was essential. Define the problem. Determine the cause. Eliminate the cause. These three sentences describe the three-step problem-solving method used by the US Military circa WWII. It is an effective tool that can be applied to all kinds of problems---not just those encountered on a battlefield. This is the second and final rewrite of this article. The earlier versions were written at a time when it seemed to me that pyramid construction would never be proved---but not because it was beyond our capability. There was no discussion of the three-step method in those versions, hence the problem definition was never stated. It may be useful for this version to know that the three-step method was used, and the problem definition that was of interest to me was: In 1969, modern man accomplished the amazing technological feat of going to the moon and safely returning, but in the early years of the next century with far more advanced technology, we still can't prove how the pyramids were constructed. Ancient men all over the globe solved the problem, but given all of our advantages, no modern man can. What's wrong with this picture? What's stopping us? That was the right question to ask because once I knew what was stopping us, it wasn't long before I knew the solution. Once I knew the solution, then I soon found evidence that a sizable number of modern men and women owned the same theory. Various media, websites, forums, and blogs show this, and some of the media is from the early '70s. The problem wasn't that no one could solve the mystery; it was that the theory was impossible to prove until recently. The idea was presented in the earlier versions that the current cause of failure is that inaccessibility to the pyramids forces us to use the wrong methodology. The general consensus of opinion is that pyramid construction is an engineering problem. Hence, most interested parties are explicitly or implicitly using the engineering methodology to attempt to solve it. Engineers think in terms of, How do you take the resources that are available and use them to build things? But this is the wrong methodology for solving the pyramids. When we think like an engineer, we get our ideas of how to build things. Since everyone has their own idea, there are many theories. In the case of pyramid construction, we don't want our ideas; we want ancient man's. He did the engineering. To get his ideas requires use of the reverse engineering methodology. To reverse engineer an object, it is necessary to have access to the object so that we may do the opposite of building it which is to take it apart, break it down into its most basic components, and analyze them. But it's impossible to take anything apart if you don't have access to it. As virtually no one on the planet has access to the pyramids, virtually no one has any chance of proving them. Of the few archaeologists who do have access, they weren't permitted to take them apart until recently. Thus, no modern man could prove how they were built. The earlier versions of this article were focused on exposing the current primary cause of failure as being inaccessibility. Once the cause is determined, then we know what must be done to eliminate it. Near the beginning of 2006, I learned that a team of archaeologists with the appropriate skills and equipment had been granted access in the Summer of 2005. That called for this final rewrite as the earlier versions had been made obsolete. No longer was there a need to argue for doing reverse engineering when it currently was being done. This rewrite contains a preview of the expected results that I anticipated would be ready for presentation in the second half of 2008 and a proof of Coral Castle construction to show its relationship to the anticipated results. On 1 December 2006, however, there was a surprise that called for this Preface to be written. An announcement was made that the theory proposed by this article had been proved by a different team of scientists. They were an international team of materials scientists that included Dr. Michel Barsoum of Drexel University in Pennsylvania and Dr. Giles Hug of the French National Aerospace Research Agency. I can only surmise that the reason this team of non-archaeologists was chosen was for their special skills and that they weren't attempting to prove their own theory. Hence, they were unbiased. Their purpose was to prove or disprove the theory proposed by another scientist. The result of their work is that the theory was proved. All versions of this article are now obsolete because the theory proposed herein no longer is a theory. It has been promoted to an established scientific fact that has been published in a scientific journal. Thus, the only remaining reasons for reading this article are to see the proof of Coral Castle and view the thought processes that went into solving it from a lay person's perspective. Of all unsolved stone megaliths, Coral Castle is the only one that can be proved without having access and permission to take it apart. One among several reasons is that others have had access and permission, have partially taken it apart, and have made their findings available to the public. That public information is sufficient to prove the general concept used to construct it. It is insufficient to get all the details, but the general concept can be proved, and it is a match for the now-proved means used to construct the pyramids. This is the link to the announcement of the pyramids having been proved. Reverse engineering and detective work employ the same principles. The explanations to follow are from the perspective of detective work as that is generally more familiar. The article begins with a discussion of proof to establish a basis for the quality of proof to be measured. Next, a brief history of a rejected theory for Egyptian pyramid construction is presented. Following that is a proof of Coral Castle construction. Last, a frequently asked question is answered. The term pyramids refers to the Egyptian pyramids. An extract from a dictionary defines proof as: That degree of evidence which convinces the mind of any truth or fact, and produces belief. Proof relies exclusively upon the amount and quality of evidence. This applies to a trial in a court of law and to scientific theories, and many of the same rules apply. All theories are innocent (they didn't do it) until they are proved guilty beyond a reasonable doubt. The owner of a theory is the prosecutor who is responsible for proving that the suspect (his or her theory) is guilty. In the western world, the symbol for justice is a blindfolded lady holding a scale. Nothing but evidence is placed on the scale, and we are the jury who weighs it. If all theories have about the same amount and weight of evidence, then the scale barely tips, and we may find it impossible to determine which, if any, is correct. If a theory has heavy evidence to support it, then the scale tips in its favor and causes us to believe that it is correct. There are times, however, when we don't have all of the important evidence. Missing evidence that is crucial to a case can cause us to convict innocent theories and/or acquit guilty theories. If we render the wrong verdict because we are missing crucial evidence, then it is unfortunate, but we are blameless because no one can weigh evidence that they don't have. For example, circa 340BC, Aristotle proposed a theory that the world is round. He knew that a lunar eclipse occurs when Earth blocks the light of the Sun and that the leading and trailing edges of the shadow on the Moon always are opposing arcs of a circle. He noticed that the North Star is closer to the horizon in the South (Egypt) than it is in the North (Greece). If the world was flat, then it should appear at the same height everywhere. He noticed that when ships sail beyond the horizon and irrespective of their direction of travel, always the last thing visible is the tips of their sails. But to prove that a round world is feasible, evidence must be produced that proves that we won't fall off of a round world. Aristotle couldn't produce it. Missing evidence about gravity meant that there was reasonable doubt. Round was acquitted, and flat remained convicted. Before we would change our minds, overwhelming evidence had to be found in the form of a demonstration by Christopher Columbus that proved that it is feasible for us not to fall off of a round world. Aristotle couldn't get a conviction for round, but it was useful to science for him to present his evidence and put forth his observations. Some would find his interpretation of the evidence to be worthy of further investigation. Since double jeopardy doesn't apply to scientific theories, it is not necessarily a bad thing for a scientist to present a theory that can't be convicted at the time it is presented. In fact, a number of scientists have done this for the pyramids. Evidence is any actual or implied statement or claim that has been verified to be true or false. Verified statements and claims are facts, and facts are evidence. Anyone can verify a statement or claim, but after initial verification, others must be able to repeat the verification and get the same result. Verification is the foundation of detective work and the means by which detectives acquire all the important facts about a case that are essential to proving it. For example, after they hear an alibi which is a statement made by a suspect, it is unknown if the suspect is being truthful. Unless the alibi is verified, it is not evidence. To convert it to evidence the detectives verify it. If it is found to be true, then it becomes evidence that supports the theory that the suspect is innocent. If it is found to be false, then it becomes evidence that supports the theory that the suspect is guilty. Either way the detectives gain information that helps them make progress. If the alibi is true, then they can eliminate the suspect and pursue another path. If the alibi is false, then they have a path to follow for further investigation. Evidence shows the paths to avoid, and it reveals the path that should be followed through the maze to arrive at the truth. An unverified statement or claim is an assumption, also known as a guess. Guessing gives us an initial path to try, but only verification can tell us if it is the correct path. Consider the alibi just mentioned. If we assume that the suspect is being truthful and treat it as if it were factual without verifying it, then we may be making a mistake by avoiding the correct path. If a guilty suspect is eliminated, then there is zero chance of solving the case unless that suspect is reexamined at some future date. One wrong guess is all it takes to become hopelessly lost. That is why the prime directive of detective work is, Verify everything. Since no modern man witnessed Egyptian pyramid construction, all of us are guessing. Guessing is good. It gives us a great number of paths to try, but because no modern man witnessed their construction, guesses must be verified using only hard evidence---not someone's story or opinion. Unverified stories, opinions, statements, and claims are potential sources of confusion that can lead to the wrong path. The only safe way to handle them is to keep them in mind and investigate any that seem promising, but don't accept them as facts and don't commit to that path until they have been verified. Science is flexible. It only accepts theories that have that degree of evidence that produces belief at the time they are presented, but it recognizes that future discoveries could produce evidence that would tip the scale in another direction. It handles this possibility by giving every theory for pyramid construction a permanent right to be evaluated or reevaluated as soon as that degree of evidence becomes available to support it. This holds true even if another theory currently is considered to be proved. The idea is that if a proved theory truly is correct as it stands, then it will stand for all time because no competing theory will ever be able to mount that degree of evidence against it. If, however, missing evidence has caused us to render the wrong verdict, then science wants to know about it, and corrections will be made as soon as it is discovered that corrections are necessary. Thus, the playing field of science is level and fair to every owner of every theory. The following paragraphs describe the kind of evidence needed to prove the pyramids. When we plan a project, the first thing we do is an evaluation to determine technologies that would be well-suited to it. For example, if we plan to till the earth, then we wouldn't consider using a table saw because it is ill-suited. If we have a hoe, then it would be considered because it is well-suited. If we have a plow, a mule, and a chicken, then the plow and mule would be considered, but not the chicken. When more than one technology is well-suited to a project, people tend to use the most efficient. If the earth to be tilled is a six-foot-diameter circular flower bed with a brick border around its perimeter and a tree at its center, then the tendency is to use the hoe because it would be more efficient than the plow and mule. If the earth to be tilled is a 40-acre field, then the tendency is to use the plow and mule rather than the hoe. If we also have a tractor, then the tendency is to use it rather than the plow and mule. For us, it is just a matter of choosing the most efficient technology at our disposal because the most efficient is the best-suited. But irrespective of efficiency, it is impossible for us to use anything that we don't have. If we don't have a tractor at our disposal, then it is impossible for us to use one. Therefore, to do a project, the minimum requirements are that we must use technology that is well-suited to it, and we must have that technology. If both requirements are met, then we have a feasible technology that we can use. If either requirement is unmet, then the technology is infeasible, and we can't use it. When proving how others performed a project, we must consider the same things for them that we would for ourselves. Whatever technology a theory proposes, evidence must be produced that proves that those who performed the project had the technology, and evidence must be produced that proves that the technology is well-suited. A demonstration comprises evidence of suitability. Producing documents written by those who performed the project that describes the technology and/or producing an example of the technology found near the project that has been dated to the time of the project or earlier comprises evidence that they had the technology. A proposed technology must be proved to be feasible before it has any chance of being convicted by the scientific community with one exception soon to be discussed. Unsolved stone megaliths can be divided into two categories with respect to feasibility. For convenience, let's call them non-extreme and extreme. Any unsolved stone megalith that has one or more feasible technologies proposed for its construction is a member of the non-extreme category. Examples are the pyramids and Stonehenge. Examples of feasible technologies that have been proposed for their construction are rollers, sledges, and levers. Members of the non-extreme category have stones whose individual features present construction problems that have a level of difficulty comparable to the stones found in most other unsolved stone megaliths. There is only one way to prove how a member of the non-extreme category was constructed. Overwhelming hard evidence must be found that proves that the technology proposed by a theory was used. If it can be proved that a technology was used, then obviously that technology is well-suited, and obviously those who performed the project had it. It would pass the feasibility test. But the most difficult stone megaliths to prove are members of the non-extreme category. Any unsolved stone megalith that has no feasible technologies proposed for its construction is a member of the extreme category. Examples are the retaining wall at the Temple of Jupiter and Coral Castle. Members of the extreme category have stones whose individual features present construction problems that have a level of difficulty that is extreme when compared to the stones found in most other unsolved stone megaliths. For example, there are only 27 blocks of limestone in the retaining wall at the Temple of Jupiter, but the lightest weighs about 675,000 pounds. There are three that rest about 20 feet above ground that each weigh about 1,750,000 pounds. Only in the last century were machines invented that are capable of lifting that much weight. It seems that ancient man must have had a machine with modern capabilities, but there is no evidence that he had one. Without such a machine, it seems that no well-suited technology even exists. Thus, no theories for construction of the retaining wall have passed the feasibility test. A member of the extreme category may be proved using the same means that must be used to prove a member of the non-extreme category, and it may also be proved by using an alternate means that only requires the proposed technology to pass part of the feasibility test. The alternate means is to propose a technology and produce hard evidence that proves that it is the only technology that is well-suited to the project that is within reach of the builders to acquire and use. Within reach means that the builders had all the resources including knowledge, skills, and materials that are essential to manufacturing and using the technology. The alternate means doesn't produce hard evidence that the builders had the technology, but the quality of the evidence is that degree of evidence needed to convince the mind that the builders had the technology and that they used it, and that fits the definition of proof. The easiest stone megaliths to prove are members of the extreme category because there are two ways to prove them, and the alternate means is much simpler. The technology soon to be discussed is well-suited to raising blocks of stone that weigh 1,750,000 pounds to a height of 20 feet without using machines, and it can be demonstrated to prove its suitability. A strong case can be made for it on that basis alone, but a problem at the Temple of Jupiter is that, to the best of my limited knowledge, the identity of the builders of the retaining wall hasn't been verified with hard evidence, meaning ancient documents. Most scholars believe that it was built by the Romans, and it is clear that the Romans built the Temple. But the retaining wall is questionable. While there is uncertainty about the identity of its builders, the problem is to prove that an unknown people had the knowledge to manufacture and use the technology. That's impossible. The retaining wall serves as an excellent example of a member of the extreme category, but Coral Castle is a better choice to prove. One reason among several for choosing Coral Castle is that the identity of the builder is well known. Another is that the exact amount of manpower used to construct it is known. That information greatly simplifies the proof as it allows accurate estimates to be made about the builder's capabilities. Yet another is that all information needed to prove Coral Castle is available on the Internet which means that anyone can verify the claims made by the proof without leaving their chair. Coral Castle will be proved by using the alternate means, but first, the theory is presented. Circa 2662BC, ancient Egyptians began building the pyramids. Several thousand years later, archaeologists became interested in discovering how they were built. Some evidence for ancient construction has been found in the form of ancient drawings that show groups of men dragging huge blocks of stone, but evidence is missing that shows specifically how the huge blocks for the pyramids were lifted and precisely set in place. Circa 1979AD, Joseph Davidovits, a neophyte archaeologist who had an unusual skill for an archaeologist entered the picture. He was doing research in chemistry at that time. He is the first, for lack of a better word, forensic archaeologist. He believes that ancient man had a technology for pyramid construction that doesn't involve dragging the huge stones. It involves carrying them in pieces and reassembling them in situ. His theory is that the stones aren't natural stones but are an ancient form of concrete (man-made stone) that appears to be identical with natural stones. When everyone is part way through the maze of a mystery and all become stuck at the same place, chances are that something hasn't been verified, and an incorrect guess has caused a wrong path to be taken somewhere prior to the place where everyone is stuck. At the pyramids, we believe that huge stones were quarried and dragged to the construction site. At this point everyone becomes stuck trying to prove how they were lifted. If there is an incorrect guess, then it will be related to quarrying or dragging. Since we know that we'll become stuck if we take the quarry-huge-stones-and-drag-them path, we should go back to the beginning and find a different path. If it seems that there is no other path, then we should begin thinking in terms of deception. Something may be wrong with the way we perceive the problem. When deception is suspected, and it is always a possibility when everyone is stuck, it helps to envision everything as having characteristics that are precisely the opposite of what we perceive. Why? Because the precise opposite of false is true. If we begin a journey at a T intersection in a road, and we know where we want to go, but we're not sure how to get there, we could turn left, or we could turn right, but only one of the choices will take us to our destination. If we turn left and that happens to be the wrong choice, then after a few thousand years we realize that we should be there by now, but we aren't. So, we turn around and go back in the opposite direction to the beginning, the T intersection, and we continue past it. This is the equivalent of having made a right turn at that intersection, and soon we arrive at our destination. We perceive armies of men dragging huge blocks of stone. That claim must be true or false. We have assumed it to be true in the past, but because we can't get to our destination on that path, we will now assume it to be false. Starting at the beginning, the means to quarry stones is the first decision we face. The opposite of quarrying huge stones is quarrying pebbles or grains of sand. They will be carried, which is the opposite of dragging, by a few, which is the opposite of armies. On the surface it seems that only a mad scientist would take this path, but if we check to determine whether any progress has been made, then we discover that this path solves the lifting problem, and it simplifies all the other problems if only we can put Humpty Dumpty back together again. In fact, it is a unified theory. There is no need to have a separate theory for transportation, a separate theory for lifting, and a separate theory for precision construction. Instead of having a kludge of theories, one elegant unified theory solves all problems and makes life much easier for ancient man. This is the other path that should be investigated and verified. Professor Davidovits's theory implies that the missing evidence hasn't been found because it is invisible just as DNA evidence is invisible. It also implies that this missing evidence has caused us to judge incorrectly that the stones are natural. In turn, that belief comprises misleading information that has caused many theories to be conceived that are based upon natural stone, none of which can be proved. His theory is far more efficient than theories based upon natural stone. It meets every challenge of construction irrespective of the problems associated with transportation, complexity, precision, levelness, weight, or the height at which the stones must be placed. Although the theory is building-material sensitive, Professor Davidovits has produced a variety of man-made stones in granite, limestone, sandstone, and others using the relatively simple technology that he calls geopolymers. Thus, his theory is potentially applicable not only to Egyptian pyramid construction but to stone megalith construction around the globe. The amount of manpower estimated to have been used to construct the pyramids ranges anywhere from 1,600 to 100,000 men. The geopolymer theory requires a number at or near the minimum. Because it is the most efficient theory, it is the best-suited and most probable. So, why was it rejected? When Professor Davidovits presented the theory in 1979 to the second International Congress of Egyptologists, substantial amounts of high-quality external evidence was available to support it, and he could demonstrate it to show that it is extremely well-suited. But he had no ancient documents that described the technology, and modern technology that could examine the internal structure of the stones and distinguish between natural and man-made stone didn't exist. The external evidence and demonstration is logical evidence, but there was no physical evidence to prove that the pyramid stones are anything other than natural stone. Without the physical evidence, there was no means to prove beyond a reasonable doubt that ancient man had the geopolymer technology. The theory couldn't pass the feasibility test, and the only prudent thing to do was what the scientists did. They rejected it. In 1982, one of the archaeologists who opposed the theory, Jean-Philippe Lauer, regardless of the disagreement gave Professor Davidovits one of his samples of pyramid stones. That act was good science. In later years sophisticated technology became available that could distinguish between natural and man-made stone. Eventually Professor Davidovits completed testing the sample, and the test results were positive that it is a fragment of a geopolymer. Now, he had the physical evidence, but the theory had already been rejected, and the provenance of the sample was suspect. The Egyptian Supreme Council of Antiquities wouldn't allow samples with certified provenance to be gathered for testing, and unless new evidence could be found, there would be no appeal. In 2001, two other forensic archaeologists, Joel Bertho and Suzanne Raynaud with skills in geophysics and geology respectively, found new external evidence to support the rejected theory, and they applied for permission to open a new study. But the theory was again denied in 2002 because it contradicts well-established beliefs such as the location of quarries. In the case of pyramid construction, it isn't a question of the intelligence of those who are weighing the evidence. It's a question of the evidence that is being weighed. There are two groups of scientists who are making mutually exclusive claims. One group must be correct, and the other must be wrong, yet both groups have excellent credentials. The reason for their polar opposite claims is that man-made stone hasn't been verified, so it isn't evidence to group one, and it can't be weighed. If the stones are natural, then the conclusions of group one absolutely are correct. Group two, however, has extended the range of human perception into the invisible by using test equipment and tests to gather the forensic evidence. Although their sample has questionable provenance, group two trusts its provenance. They are weighing more evidence than group one, and the additional evidence is heavy evidence that tips the scale in another direction. Whenever a theory is proposed that claims that heavy evidence is missing, this is a fundamental issue that must be resolved as soon as it is within our power to do so because it implies that our judgment may be biased. We have always believed that the stones are natural because our senses tell us that they are, but there is subtlety here. The claim that the stones are man made has never been verified by testing pyramid stones that have certified provenance, but the subtlety is that neither has the claim that they are natural. Group one should not be weighing evidence that the stones are natural because it's not evidence until it has been verified. Therefore, while the stones remain untested and the nature of the building material remains uncertain, there can be no proof of any theory. In June 2005, permission was granted to Joel Bertho and Suzanne Raynaud to open a new study and settle this fundamental issue once and for all. The study is underway and is due to be completed in 2008. Minus samples of pyramid stones that have certified provenance, skills, and equipment to test them, no one can prove whether they are natural or man made. But there are many unsolved megaliths around the globe. Coral Castle, the youngest unsolved megalith, has stones that have extreme features that make it possible to prove that they are man-made using only external evidence found on the Internet. Coral Castle was built in the early part of the 20th century by Edward Leedskalnin. Ed was a stonemason who weighed 100 pounds and stood just over 5 feet tall. He worked alone under cover of darkness using lantern light to assure that he would not be seen. He used only hand tools and a simple hoist. The average weight of his blocks of coral stone is 12,000 pounds. The average weight of the blocks of limestone used in the casing of the Great Pyramid is 5,000 pounds. Ed did not own an automobile, and there was no wired electricity at Coral Castle. He acquired an automobile generator from a junkyard, but that was after he built Coral Castle. It could not have been used during construction, and he made no claim that it was needed. Ed was a recluse who passed in December of 1951 without ever disclosing the secrets. The nine-ton gate has extreme features that make it possible to prove that it is man-made stone. The Coral Castle web site reports that this 18,000 pound gate is so perfectly balanced that it can be opened with the simple push of a finger. It closes to within a quarter inch on either side of the frame opening. It broke in 1986. Six men and a 50-ton crane were needed to remove and repair it. What they found was that Ed had centered and balanced it using an iron shaft and truck bearing. He found the perfect center of gravity and drilled an almost-perfect-round eight-foot hole for the shaft using only hand tools. Today a laser-guided drill bit would be used to achieve such extreme precision. 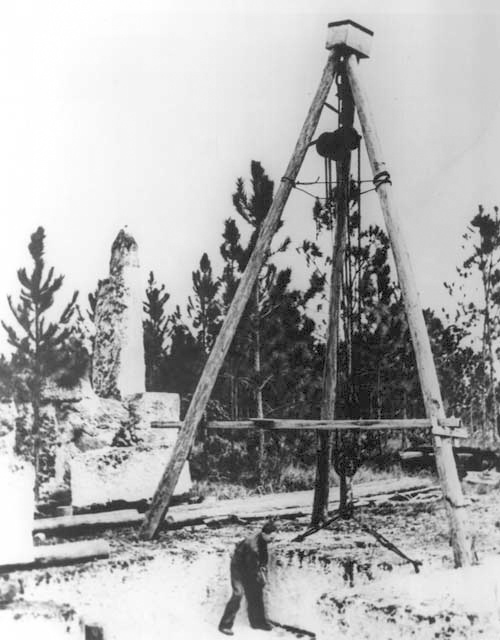 Figure 1 is a photograph from the gallery of the Coral Castle web site that shows Ed using a hoist to lift a block of coral stone. There are only two possibilities with respect to this photograph. One is that he used this hoist to lift the huge blocks of stone exactly as shown. The other is that he didn't. If he did, then there is no mystery about Coral Castle construction because this is a photograph of the solution. If he didn't, then there can be no other purpose for this photograph than to deceive us because it depicts something that is false, and that would be misleading information. It is crucial to verify the implied statement that Ed used the hoist as depicted so that we know what path to take. Is that statement true---or is it false? The mechanical advantage (a multiplier of effort) of a hoist equals the number of chain segments ascending from its movable block of pulleys at the bottom to the fixed block of pulleys at the top. The photograph is unclear, but with a little eye strain 6 segments can be seen. If Ed grasped the fall of this hoist and suspended himself by hanging from it, then the effort of his 100 pound body weight would have been multiplied by a factor of 6, and he would have produced a lifting force of 100 X 6 = 600 pounds. This means that he couldn't lift more than 600 pounds with this hoist, but the stone shown being lifted weighs at least ten times that. Using Ed's known height of 5 feet for a reference, a conservative estimate of the stone's dimensions and volume is 4' X 4' X 3' = 48 cubic feet. A conservative estimate of its weight based upon a density of 125 pounds per cubic foot, is 48 X 125 = 6,000 pounds. There is a huge discrepancy between the weight of this stone and the maximum amount of weight that Ed could lift. Because it was impossible for Ed to have lifted this stone with this hoist, the only possible explanations for what is seen are that the photograph was tampered, or the stone is a hollow shell that weighed only a few hundred pounds. Either would be deceptive, but the latter is more probable because it is more efficient. There is no need for Ed to have skills in creating special effects in photographs. He only needs his stonemason skills to make a hollow shell and the broken stone in the background. The purpose of the broken stone is to convince us that he was not lifting a hollow shell. Some hoist theories recognize that the stone in Figure 1 can't be lifted by Ed and his hoist alone. One claims that he used a motor hidden in the mysterious box at the top of the tripod regardless that there is no room for a motor, no source of electricity, and no drive chain and pulley. Another claims that the motor is hidden within and connected directly to the pulleys. Yet another claims that a winch was used. The theories in the previous paragraph are unprovable because no electricity, motors, or winches have been found at Coral Castle, no hard evidence has been found that indicates that they ever existed there, and no hard evidence has been found that proves that Ed had the knowledge, skills, and materials needed to invent these items. But even if such evidence had been found, it wouldn't solve Ed's problem of transporting the stone. Examination of the tripod in the photograph reveals that it has no wheels. It would have been impossible for Ed to transport the stone from the quarry to his creation under construction using this arrangement. Notice the number and difficulty of the obstacles that Ed must overcome to use hoists. First, we see him lifting a 6,000 pound block of stone, but laws of physics prove that he can't lift it without a motor. He must somehow acquire and mount a motor, but a motor needs electricity. He must somehow acquire a source of electricity and wire it to the motor. Since the tripod has no wheels, he must somehow acquire a means to transfer the stone from the hoist to a mechanical transport. He must somehow acquire the mechanical transport. He must have skills in electrical and mechanical engineering. Thus far, these are six obstacles that Ed must overcome before he can even begin building Coral Castle using hoists. Hard evidence must be found to prove that all of these things were within his reach, and overcoming these six obstacles only allows him to get the block of stone to the creation under construction. There are more obstacles soon to be presented. Because analysis of the photographic evidence proves that it was impossible for Ed to construct Coral Castle using hoists in the manner shown, this scene is a grandiose, well-staged, and effective attempt to deceive us. It was impossible for Ed to use the hoist as depicted, and with only hand tools it was impossible for him to lift and transport the 18,000 pound gate all at once. These are eliminated. The only remaining possibility, however improbable, is that he lifted and transported the gate a piece at a time. As he could only lift pieces of the gate, then by default he must have made mud, clay, cement, or concrete from coral stone. Mud, clay, cement, or concrete henceforth will be identified as ancient cement or man-made stone which are treated as synonyms and used interchangeably. Man-made stone is a general concept---not a specific formula. No attempt is made to prove the specific formula or stonemason techniques that are involved. To discover those requires hands-on testing of samples of Coral Castle stones by experts. The only concern here is to produce hard evidence that proves that man-made stone is the only technology that is well-suited to the construction of Coral Castle that is fully within Ed's reach to manufacture and use. Evidence reveals that the path leads toward man-made blocks of coral stone, and that becomes the path to follow. Ancient cement presents Ed with only three obstacles that are minor to a highly skilled stonemason. To claim that ancient cement is fully within Ed's reach requires verification that he could overcome them. The first is that he must have knowledge of and be able to manufacture ancient cement from coral stone. The second is that he must be able to construct forms (wooden containers) for use with ancient cement. The third is that he must be able to disguise his man-made coral stone to make it appear to be natural coral stone. The first two must be directly verified, but the latter is indirectly verified by default if it is proved that ancient cement is the only well-suited technology that is within his reach. As cement is a standard tool employed by stonemasons, Ed would have had knowledge of cement. The patent for Portland cement, the most widely distributed cement in the world, was awarded to Joseph Aspdin in 1824. Mr. Aspdin was a stonemason from Leeds, North Yorkshire, England. Coral stone is one of Ed's many deceptions. It seems only to be an innocently convenient building material indigenous to the area, but it's not. It is rich in calcium carbonate, the primary chemical compound used to manufacture modern cement. The lower left quadrant of this Bamburi Cement, LTD. web page shows that they use coral stone for their source of calcium carbonate. Coral stone is well-suited to manufacturing ancient cement. Ed worked in lumber camps for a number of years prior to building Rock Gate Park, his deceptive choice of a name that was changed to Coral Castle after he passed. He was exposed to woodworking techniques in those camps. His woodworking skills are well-suited to making forms for use with ancient cement. Evidence must be presented that proves that ancient cement is well-suited to building every creation at Coral Castle. If even one creation can't be built by a lone stonemason who only uses hand tools and ancient cement, then ancient cement must have assistance from one or more additional theories to solve the challenges that it can't meet. After Ed passed, his tool collection was examined. It included chains, saws, drills, wedges, hammers, chisels, and crowbars, but there is no mention of an eight-foot drill bit the exact diameter of the shaft of the nine-ton gate. If Ed's need for saws and drills was to facilitate making forms for use with ancient cement, then that would explain the presence of a scattering of oversize half-ton chairs that have no tool marks on them. If they were carved, then tool marks should be present, but missing tool marks is a byproduct of using forms and cement. Ed was a professional stonemason-magician-entertainer. His purpose was to impress and amaze people. When visitors see Coral Castle, they are impressed and amazed by the size of his creations---not by missing minutia. As virtually no one would be impressed by missing tool marks because virtually no one would notice, it is far more probable that missing tool marks is a byproduct of his technology than that he deliberately spent time ensuring that he left no tool marks. Ancient cement is the only stone technology that Ed could have employed that has missing tool marks as a natural byproduct. Ancient cement is well-suited to making chairs with no tool marks, but every theory based upon natural stone faces a daunting challenge. Each owner of a natural-stone theory must propose a means for Ed to carve chairs without leaving tool marks and produce evidence that proves that it is well-suited and within Ed's reach. If the proposed means requires Ed to do anything, then it is less efficient than ancient cement which requires him to do nothing. Coincidentally, there are no tool marks on the remaining casing stones of the Great Pyramid which are made of limestone. Limestone is the source of calcium carbonate used in manufacturing Portland cement. It is a non-clastic sedimentary rock formed from deposits of coral reefs and a relative of coral stone. Ed had stonemason skills, woodworking skills, hand tools, natural forces, and natural resources. These are the same things that ancient man had. He built the nine-ton gate using those plus an iron shaft and a truck bearing. The procedure that follows is not intended to represent the exact procedure that Ed used. Its purpose is to describe the difficulties that Ed would encounter while using ancient cement to show how it would help him overcome them. This will prove that ancient cement is well-suited for use by a lone stonemason who wants to build a nine-ton gate using only the items listed in the previous paragraph. There is no need to do an actual demonstration to prove suitability because cement is a well-known technology. There are enormous numbers of alternate examples of cement that prove its capabilities, and virtually every adult on the planet is familiar with the operational behavior of cement. But for those who would like to see an actual demonstration, a link to a video of a demonstration by Professor Davidovits is provided near the end of this proof. Please recall that there is no attempt to prove the specific techniques that Ed used to disguise the stones. Those techniques are cosmetic issues that are unrelated to the suitability of cement for construction. The following procedure is based upon using homemade ancient cement that contains no gypsum, an additive used in modern commercial cement manufacturing that reduces the time needed for the cement to cure (harden). This allows Ed more time to work before the cement begins to set when compared with modern commercial cement. WARNING: DO NOT TRY THIS. NO LIABILITY IS ACCEPTED FOR ANY CONSEQUENCES RESULTING FROM FOLLOWING THESE INSTRUCTIONS. Given that the gate frame was constructed and ready, Ed snapped chalk lines along the diagonals of the top interior of the frame. He marked the exact center where they crossed, attached a plumb bob to that mark, dropped it, and marked the bottom. Using the top and bottom reference marks, he installed the iron shaft and truck bearing correctly centered and perfectly vertically aligned. Next, he placed shims such as small ball bearings on the bottom of the frame and surrounding area. Following that, he placed two boards atop the shims, one on each side of the shaft. The parts of the boards that were adjacent to the truck bearing had cutouts that matched the diameter of the bearing. Using these boards as the base, a wooden form shaped like the gate was built around the shaft. The form was built slightly wider than the frame opening and perpendicular to it. Building the form perpendicular to the frame opening facilitates removing it after curing is complete, and building it slightly wider than the frame opening facilitates adjusting the gate to cause it to close within a quarter inch on either side of the frame opening. Following form construction, Ed filled it with ancient cement. (Note: It is possible that he accelerated task completion by using the large hoists to lift buckets of cement that weighed several hundred pounds.) When the cement had cured, he removed the form. Then, he shaved the ends of the gate until it would close to within a quarter inch of the gate frame opening and changed its appearance to conceal that it was man-made stone. Construction was complete. Ed's perfect round eight-foot hole is the overwhelming evidence within the gate itself that confirms that it is man-made stone. Virtually every theory for Coral Castle construction is focused on solving only the lifting problem, but the hole is unrelated to lifting. If the owner of a theory that is focused on lifting such as a hoist theory can't produce evidence that a hoist is well-suited to making a perfect eight-foot hole, then it must have assistance. A second theory must be proposed to make the perfect hole and evidence produced that shows that it is well-suited and within Ed's reach. Ancient cement requires no assistance. The Coral Castle web site reports that a laser-guided drill bit would be needed to achieve the level of precision of this hole, but Ed had only hand tools. Hand tools are ill-suited and infeasible for drilling a laser-perfect hole, but there it is. If its diameter was a tiny fraction too small, then the shaft wouldn't pass through and if a tiny fraction too large, then the precision wouldn't rival that of a hole drilled by a laser-guided drill bit. Three requirements must be met to achieve perfect balance of the gate. The shaft must be sturdy, it must be mounted perfectly vertical, and its diameter must be perfectly matched to the hole. That is all. The latter requirement verifies that the claim made by the Coral Castle web site about the perfection of the hole is true, else the gate would not have been perfectly balanced. The Coral Castle web site also reports that the hole passes through the perfect center of gravity of the gate thus enabling it to be opened by the simple push of a finger and that no one can discover how Ed accomplished this amazing feat. This claim is suspect. Because the hole was positioned near the center of the gate, it is possible that it passes through the perfect center of gravity. But if it does, then it is vastly more probable that it was an accidental accomplishment rather than a deliberate one because the hole passing through the perfect center of gravity is not one of the three requirements for achieving perfect balance. Therefore, there was no reason for Ed to try to find the perfect center of gravity. The position of the hole has no effect upon the balance of the gate nor the ease with which it can be opened, and the following paragraph verifies this claim. Imagine a standard door in your home that has had the customary two or three hinges replaced with one long hinge that runs the full length of the door from top to bottom. There is a matching hinge pin. The center of gravity of the door is located somewhere near its center, but the hinge is located at its edge. Because the hinge is sturdy, perfectly vertical, and the hinge pin perfectly matches the hinge, the door opens easily, is perfectly balanced, and stays wherever it is placed regardless that all of its weight is distributed on one side of the hinge. If a saw was used to remove an arbitrarily large segment of the door, the location of the center of gravity would change, but the segment that remained attached to the hinge still would be perfectly balanced and easy to open. Therefore, once the ancient cement had cured, Ed could shave the ends of the gate so that it would close to within a quarter inch on either side of the frame and make all other changes he deemed necessary with no concern that he might destroy the delicate balance. In the gate-construction-procedure section, the shaft was easily mounted perfectly vertical and correctly centered as there was no weight on it when it was mounted. Ed could take all the time he needed to assure himself that it was correctly mounted. Ancient cement is well-suited to helping Ed solve the shaft mounting problem, but every theory based upon natural stone faces another daunting challenge. Each owner of a natural-stone theory must propose a means for Ed to mount the shaft perfectly vertical and correctly centered while there is an 18,000 pound block of stone surrounding it and produce evidence that proves that it is well-suited and within Ed's reach. Ed didn't need an eight-foot drill bit the exact diameter of the shaft because no hole was drilled. The liquid cement merely surrounded the shaft, closed tight against it, and cured. When the shaft was removed during gate repair, Mother Nature's perfect-round eight-foot hole was discovered, and a laser-guided drill bit couldn't do a better job. Ancient cement is well-suited to making the perfect hole as it is a byproduct of the technology, but every theory based upon natural stone faces yet another daunting challenge. Each owner of a natural-stone theory must propose a means for Ed to drill a perfect eight-foot hole using only ill-suited hand tools and produce evidence that proves that it is well-suited and within Ed's reach. If the proposed means requires Ed to do anything, then it is less efficient than ancient cement which requires him to do nothing. Ed would have known that ancient man had skills, hand tools, natural forces, and natural resources comparable to his own. This explains how he could claim to know how ancient man raised huge blocks of stone using only primitive tools. In fact, ancient cement itself is a primitive tool because modern chemical engineers have a nickname. They're known as toolmakers. Ancient cement is the only theory that explains why Ed would build hoists that are unusable as depicted, for if the stones are natural, then there is no reason to try to deceive us into believing that they are natural. It allows him to work in the dark in relative safety when compared with the idea of working with huge blocks of natural stone. It explains how he built chairs with no tool marks on them. Manufacturing ancient cement from coral stone has been proved to be within his reach. Building forms has been proved to be within his reach. Ancient cement has been proved to be well-suited to transporting, lifting, precision construction, making chairs with no tool marks, making the perfect hole, and mounting and balancing the nine-ton gate. Hard evidence has been produced that Ed's hoist could only be used to lift stones that weigh a few hundred pounds, and without wheels on the tripod, it couldn't be used to transport stones. Hoists are ill-suited for making a perfect hole and for making chairs with no tool marks. Many theories have been proposed for Coral Castle, but only ancient cement and hoists have been proved to be within Ed's reach, and only ancient cement can be demonstrated to show that it can pass the well-suited part of the feasibility test. Until some other theory can be demonstrated to show that it is well-suited and hard evidence produced to prove that it was within Ed's reach, there are no other challengers. 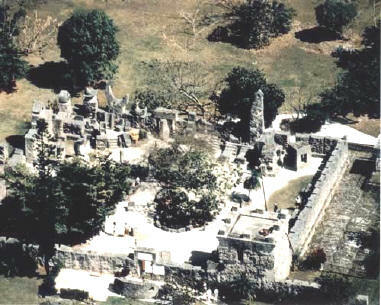 The requirements have been met for proof of the ancient cement concept having been used to construct Coral Castle's nine-ton gate. 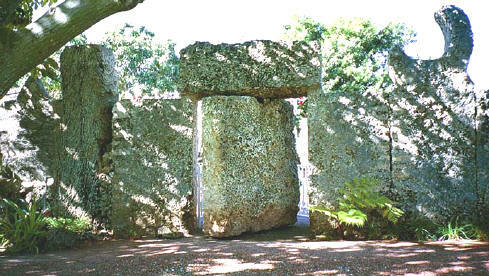 Because every creation at Coral Castle is made of coral stone, every creation can be constructed using ancient cement. Coral Castle construction is proved. Proof of Coral Castle construction, however, does not prove that the pyramids were built using man made stone. Only scientists can prove or disprove that by testing the stones. What Coral Castle proves is that man-made stone can appear indistinguishable from natural stone and that stones can be disassembled and reassembled using a simple process that doesn't require machinery or rotary kilns like those used in modern cement manufacture. Those are statements that Professor Davidovits implied or made for pyramid construction, and Coral Castle provides a model that supports those statements. Thousands of years have passed since the pyramids were built, and no theory based upon natural stone has ever found overwhelming evidence to support it. Since all evidence for natural-stone-based theories is visible, if overwhelming evidence exists, then it should have been found by now. Since it hasn't been found, it is reasonable to conclude that either it has been destroyed by time, or that it never existed. If either of those is true, then no theory based upon natural stone, known laws of physics, and ancient man building the pyramids without assistance from intelligent beings such as aliens, time travelers, or Merlin the Magician can ever be proved. The only remaining place where overwhelming evidence might be found that hasn't been exhaustively examined is the internal structure of the stones. If their examination proves that they are natural, then the overwhelming evidence must have been destroyed by time. If it proves that they are man-made, then the man-made-stone theory is correct. Since multiple types of building materials were used in the pyramids, it is possible that a mixture of man-made and natural stone was used, but only testing can determine that. Professor Davidovits has a video available for download from his web site that demonstrates the suitability of the geopolymer technology. In the video, he produced several multi-ton blocks of limestone concrete. Joel Bertho and Suzanne Raynaud are gathering forensic evidence from testing pyramid stones that have certified provenance. Their initial indication is that the stones are man made. If the initial indication holds, then this will be hard evidence that proves that ancient man had the geopolymer technology and that he used it. In that case, it is probable that the next time this theory is presented to the scientific community, it will lose its status as a theory and become an established scientific fact. This link to a press kit in Adobe PDF format that was released in 2004 offers a 15 page summary of the story from Professor Davidovits's point of view. It contains a photograph of a number of different building materials that were made using geopolymer chemistry. How did Ed move his creations from Florida City to Homestead? All attacks against ancient cement at Coral Castle have been based upon unverified stories and opinions. The above question is based on the unverified statement that the move took place. The question that needs to be answered first is, Did Ed move his creations from Florida City to Homestead? There are many who claim that he did, but until this story is verified with hard evidence, it is not a fact. I claim that the move was another of Ed's deceptions, that he was parading hollow shells of some of his creations, that he destroyed them once the deception was complete, and that he rebuilt replicas of his Florida City creations in Homestead. But there is a problem with verifying my claim. Suppose that I was able to compare photographs of all of Ed's creations in Florida City with photographs of all of his creations in Homestead, and suppose that none that were in Florida City are identical with their counterpart in Homestead. That would seem to be overwhelming evidence that the move didn't take place, but it isn't. The reason is that it could be claimed that Ed moved the creations and upgraded them over time. Although all evidence presented thus far indicates that the move could not have taken place with his real creations, it is impossible for me to verify that it didn't. On the other hand, it hasn't been verified that it did take place either. If someone has Florida City photographs and wants to attempt to verify that the move took place, then they have a potentially simple task. All they need do is find one creation currently in Homestead or in any Homestead photograph that can be proved to be identical with its counterpart in any Florida City photograph. Email: slimebug at adelphia dot net - Please add the word 'megaliths' to the subject line to authorize your email to pass through my spam blocker. In construction, concrete is a composite building material made from the combination of aggregate and cement binder. The most common form of concrete consists of Portland cement, mineral aggregates (generally gravel and sand) and water. Contrary to common belief, concrete does not solidify from drying after mixing and placement. Instead, the cement hydrates, gluing the other components together and eventually creating a stone-like material. When used in the generic sense, this is the material referred to by the term concrete. Concrete is used to make pavements, building structures, foundations, motorways/roads, overpasses, parking structures, brick/block walls and bases for gates, fences and poles. Concrete is used more than any other man-made material on the planet, with water being the only substance on Earth we utilize more. An old name for concrete is liquid stone.